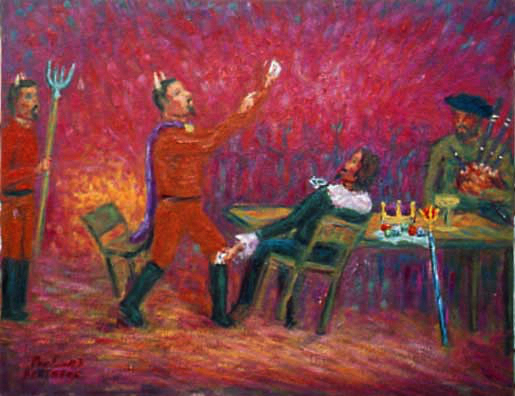 "Babinsky Cheating the Devil at Cards"
This picture is from the opera "Schwanda the "Bagpiper" by Jaromir Weinberger. Babinsky is a legendary Czech character who is like Robin Hood. He leaves his cuff as his signature. In this picture, Schwanda has landed in Hell, and Babinsky is rescuing him. Babinsky is acquainted with the Devil. In the opera he has broken into the Devil's store room, stolen his jewels, and is now using them as wagers against Schwanda's soul. Like everyone, Babinsky knows the Devil cheats at cards, which is why nobody else will play with him. When the Devil jumps up and declares victory, Babinsky pulls the trump card from the Devil's boot, and wins. Schwanda is returned to his wife Dorotchka, and all is well. PaulB's Pointillistic/Impressionist original oil paintings of Opera and various prints and poster formats of a wide variety of subject matter by the Pointillistic/Impressionist oil painter from landscape/waterscape paintings, dance, sports, portrait, to classical figures, flowers, rock and roll, Brazil, and Opera paintings and prints are available for purchase for as little as $24.95 for an 8" x 10" matted print on photo pape. Pointillistic/Impressionist Giclee prints of Opera on real canvas or heavy watercolor paper are available. One of a kind Opera embellished prints, which are Giclee prints retouched in genuine oil paint by PaulB. Unless noted PaulB's original Pointillistic/Impressionist oil paintiings are oil on canvas. Paul Berenson's pointillistic/Impressionist oil paintings are in privale collections around the world, including the downtown Los Angeles Athletic Club and have appeared in numerous publications, including the New York Philharmonic Playbill. PaulB.com also builds websites and PaulB is a member of the LA Web Professionals Group.